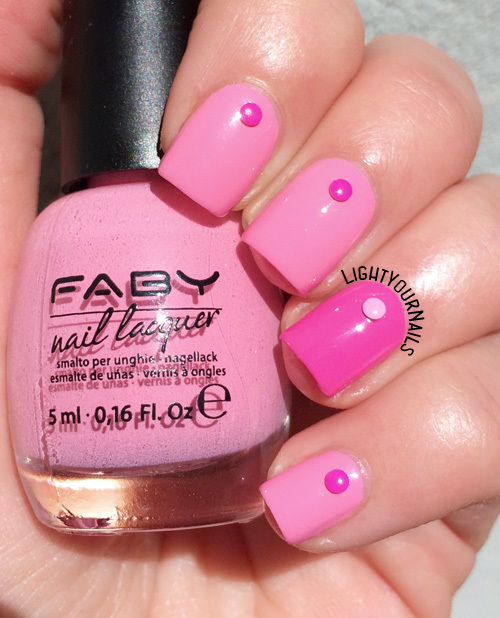 Pink nails with Faby | Light Your Nails! Lovely, I do like pink a lot! È una nail art semplice ma fa comunque la sua gran bella figura! Poi, vabbè, è rosa, che altro si può dire? Yay! I like pink, too! It looks very nice with the added studs! I just love how perfectly you matched the studs to the contrasting colour. Gorgeous mani! Bwahaha grazie! Evviva la casalinghità! Love those pastel dots! And they are so perfect for your mani!! I have plenty of them, too! I have the same studs and I love them too! This makes me want to pull them out. I know right? When you see them you'd want to use them right away! these studs are perfectly colored. I had to read twice to see if you painted them to match. I am too lazy for that. If I had no matching colours I would have used golden studs instead! This is such a simple classy pink mani. It's beautiful! I love this!!!!!! And it's so easy! Thank you Ann! I'm all for easy manis! These are really cute! Sometimes simple nail art is the best!